Kristen and I had a couples massage at the spa in La Cruz. The last time I had had a massage was when we were dating, and a massage student needed hours. We graciously volunteered. So it had been a while for me, and honestly, I was feeling a little nervous. The venue was classic Mexico. Half of the establishment was outside, half inside. 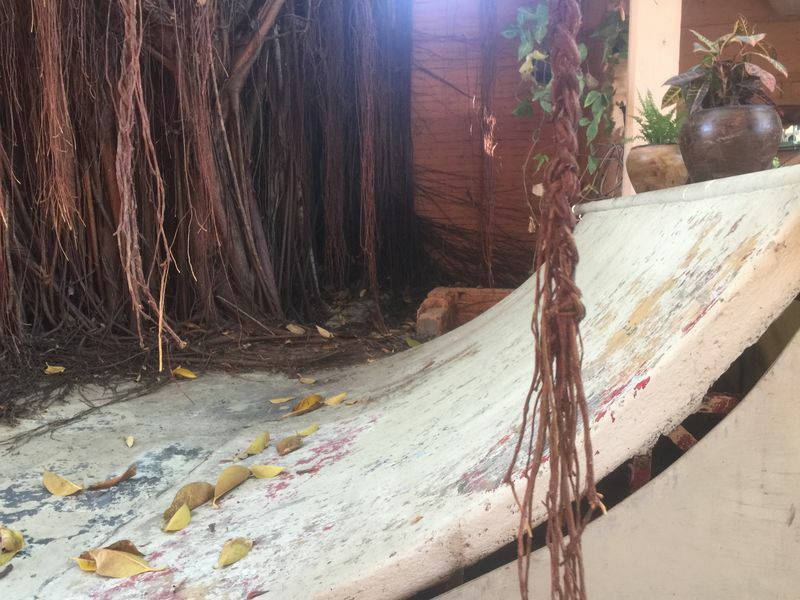 The outside bit was nicely shaded, lots of plants, very well decorated, and had a half pipe. You know, the kind you skateboard on. Vegetation was reclaiming the constituent materials, but it was mostly still there. Our time came, and we were escorted into a room with dual massage tables. Left alone, we disrobed, and slipped under the sheets face down. Massage veterans will know you put your face in the little donut so you can lie face down without suffocating. Nice touch. Two people very silently entered the room. Their entry matched the peaceful music and light incense. Hands gently rubbed my body through the sheet, and a hot towel was placed on top of me. Opening my eye, just one since the other was smashed into the donut, I could see a brown socked foot. My masseuse paused briefly, I heard a soft pump-pump, and her warm oiled hands were on my neck and in my hair, rubbing in earnest. Exactly three seconds into the rub, I was a bit lost. She worked on my neck, head and ears, rotating my head this way and that, using her arms and elbows in addition to her hands to smoothly bear the entire weight of my head. I'm pretty sure I drooled on her brown sock. She moved the sheet down to my waist, gently folding it just right, and as she pressed her (pump-pump) oiled hands on my bare skin, the rest of my body melted away. I no longer had any sensation below my shoulders. I was an eel, a being without arms and legs, the top of my torso barely existed. The hands of the masseuse were warm, rubbing back and forth, up and down my body, like I was floating underwater in a gentle tidal surge. As her (pump-pump) hands worked my muscles, my eel body felt her fingers as tree roots below the water, like in a mangrove swamp, working my knotted muscle. Her elbows were smooth, round rocks, caressing and pressing, and her oiled hands, always present and in contact with my skin, where like delightful warm mud, encasing and holding my tubular torso in exquisit comfort as the watery surge took me back and forth, back and forth, back and forth across and through the rocks, the roots, and the mud. Down my side she went and woke up a part of me I didn't know I had. A fin! I was a one finned eel! Oh, how miraculous the rocks and roots felt as my eely body rubbed back and forth with the current, in the mud. As she worked my arm, my fingers, oh!, I realized I was not an eel, but a (pump-pump) salamander, still in the water, caressed by warm, soft mud. Muscles I didn't know I had a minute ago sighed with delight at being found in the rocks, and the roots, and the mud. Fingers! Oh my fingers! Each little finger was discovered one by one as they were pressed and pulled. They were pushed aside, squeezed close, pull up and down, out and in between the rocks, the roots, and the mud. Back up my arm, to my shoulders that I now knew were proper, and down the other side to my other arm, the other arm I didn't know that I had until that very moment in time. Down to my fingers went the rocks and the roots, awakening my body with each new press and pull. I only knew the now, forgetting the (pump-pump) past, I was never an eel, and certainly never thought about what was to come as I was embraced, hugged, and loved, by the rocks, the roots and the mud. Her hands moved down past my waist, where (pump-pump) miraculously I now had legs. Strong and smooth, my legs surged back and forth in the water, held lovingly by the warm mud, while the rocks and the roots rubbed and pulled, pressed and pushed. Feet? Yes, oh yes, feet. Feet! Toes! I never knew that salamanders had the most amazing, the most wonderful toes. Each toe, never known to the toe before it, was embraced and worshiped. None of them were neglected, even as all ten were exposed, proven to exist. Even the spaces between each toe, that space which has no name, at least to my salamander brain, where rubbed and pressed, lovingly attended to, by the rocks, the roots, and the mud. The brown socked woman asked me to turn over. My external lethargy belied the eagerness my amphibious form felt, eager to discover more, to learn more about this strange and wonderous body. Ms. Brown Sock covered my eyes with a warm towel, rubbed my chest, easing out knots like a sailor with her roots and rocks, still and always encased in warm mud, surging in the sea. More (pump-pump) of my legs became known, my arms where made whole, my neck and head where held with firmness and comfort by the rocks, the roots and the mud. Ms. Brown leaned over close to tell me the session was over, it was time to rise up from the water. After Ms. Brown Sock padded away and out, I opened my eyes for the first time, looked for my love and to my surprise she was right there! All along, she was with me, in her own salamander form, discovering her body again, just as I had, in the rocks, the roots, and the mud.